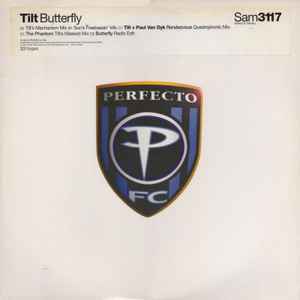 Rendezvous was remade a year later with the addition of vocals and retitled "Invisible"
in my personal opinion the Butterfly radio version is one of Tilt's finest work. great vocals, melody, bass- and piano line all driven and mixed in perfection. what's make this version even special for me is that an instrumental sample i know very well from "Grace - Not Over Yet", is present throughout the song but especially in the chorus parts. love it. 'Butterfly' is a crisp example of the cracking trancers Graham, Parks & Wilson used to pop out in their heyday. It has a great drive, nice bassline and razor sharp production. However, this is all spoiled by Zee Cowling's terrible vocals. The real surpise on this is the b-side. 'The Phantom' is drum & bass flirting track and when I first heard this i didn't think much of it. It sits between a juxtaposed position between the style of trance Tilt was outputting and nuskool breaks which Parks & Wilson would be do more of later on. It did however grow on me a lot when i heard it again a few years later. The piece itself is a driving piece of music with a dirty breakbeat and a low subby bassline. Synthtwitters & some dark pads back up a synthy guitarplucked as the main lead. The track is criminally overlooked in my opinion. I really had to say it--the B-side is probably my one most favorite record of all times, just recently got this single and I'm happy! It's sheer of melody, build up and energy--just like you would think a PvD and Tilt collaboration to be... Hope I'll get to hear it live one day.